When I decided to make a very simple soup for this post, I though “oh, this will be easy and cleanup will be a cinch”. Well, I’m sorry to report that that didn’t happen. When I was taking photographs, I surveyed the kitchen and my heart sank. As hard as I try, I still seem to mess up almost everything in the kitchen regardless of what I’m making. This soup is clean, healthful, and delicious. Serve it with some buttered, crusty bread and it’s dinner on a cool autumn night. 1. Heat olive oil in a stock pot over medium heat. Add onion and garlic and saute for about four to five minutes or until onions are translucent. 2. Add chicken stock, sausage, tomatoes, beans, salt, pepper, thyme, and bay leaf to the pot. Reduce heat to low, cover, and simmer for 15 minutes. 3. Add kale and cook for five minutes until kale is wilted. 4. Ladle into soup bowls and garnish with Parmesan cheese. Serve immediately. Thanks for the feedback, Alyssa! I’m so glad you enjoyed the recipe! I love the idea of the chickpeas in this soup! Thanks for dropping by and I hope you’ll come back soon! I fixed this for dinner/and healthy lunches for the week. I used italian sausage, (3 links), and 2 cubed boneless chicken breasts. I browned the chicken, and sausage, I also added about 2 tbs of tomato past, (just because I had some open from another dish I ha prepared today_ It was delicious. I’m so glad you liked the recipe, Christy. I appreciate your dropping by Southern Boy Dishes and giving me your feedback. I hope you’ll keep coming back! Thank you so much for the feedback, Debra. I’m so glad you enjoyed it! What an absolutely hearty soup! This looks soul satisfying! Just made this tonight with chicken feta spinach sausage and it was DEEEELISH! Took 45 min from nuts to soup. I will keep this recipe handy! You had me at sausage. 🙂 I love hearty soups so I’m moving this to the top of the to-make list — thanks! I’ve gotten pretty good at mise en place, and reasonably good at cleaning up as I go. So usually there’s not too huge of a mess when I’m done cooking (although there most definitely is still a mess). Anyway, great soup. I love kale (or any dark green) in soup with beans. And chicken sausage? So much the better. Really nice – thanks. A gorgeous hearty soup. Pinning for sure. I made some home made sausages, it would be so good in the recipe. I think we may be psychically (had to look up how to spell that, I started with about 6 “c”s!!!) connected, Bill – I’ll have you saying “Cor Blimey” in no time at all 😉 Beautiful photograph, and GAWJUS recipe. I love anything with beans in it. Whole plethoras of them. 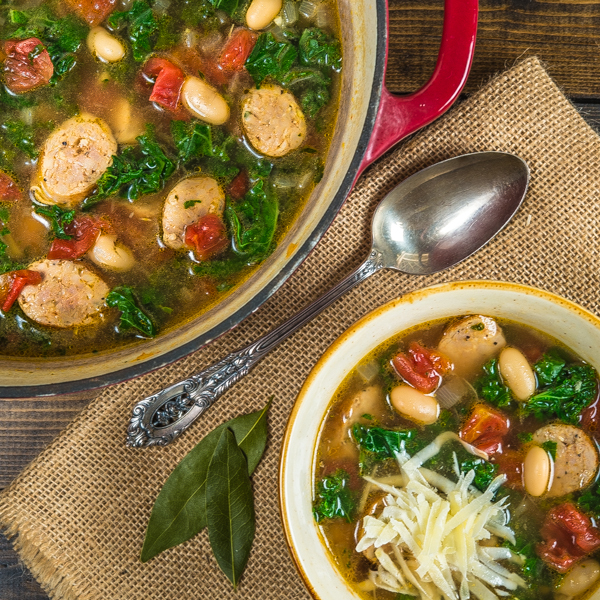 With the cold weather coming through this week, this soup would be perfect! So healthy, comforting and tasty! Love the pictures! They make me quite hungry. Mis en place = mess in place. I finally learned to clean up as I go, only because my kitchen is small with minimal counter space. Plus, my husband is the cleaner upper and I don’t want to discourage him. I’d say this soup is beautiful and clean eating. Looks fantastic! Looks delicious.. perfect on cold night dinner 🙂 I love kale in it .. It must be catching because I do the same thing here. Love this soup, esp. with the beans. Always looking for a new one to try! Thanks.